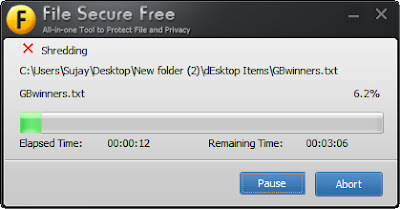 File Secure Free is all-in-one freeware in password locking folder, file and USB without any limitations. It is No.1 FREE software in protecting files and privacy, even more powerful than some paid applications. It has many useful functions, password lock folder and files, password lock USB drive, external hard drive and any other removable devices, file backup, file shredder, etc. Supported OS: Windows 7/Vista/XP 32/64 bit.Processor: >750MHz Intel or AMD CPU X86(32bit) or X64(64bit).Free Hard Disk Space: 100MB or more.RAM: 256MB or above. 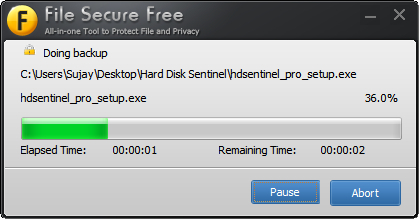 The installer [FileSecureFree_setup.exe ; 2.13 Mb] is not digitally signed. Installation went fast and smooth without any unwanted software. 4.1 Mb of free disk space is required. Opens homepage at the end of installation. Desktop icon is created automatically. The software GUI is decent in look and easy to use and navigate. 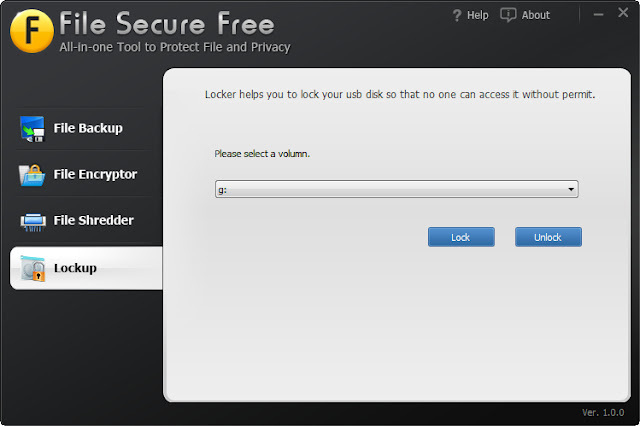 It is divided into four sections to backup files/folders, encrypt files, shred files/folders and lock USB drives. Upon closing the GUI, it stays in Tray. If you want it to exit, quit it from Tray. Backing up files and folders is pretty easy. 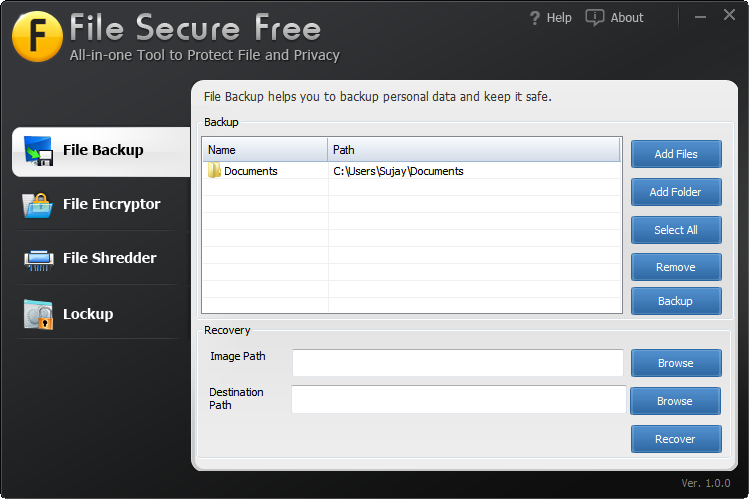 Just add the files and folders to backup, select them and click on ‘Backup’. You will be prompted to browse for a location to save the backup and to enter a password for securing the backup. Password needs to be at least six characters long. The backup is saved as File Secure Free Image Files (*.dfi). You can of course give separate password for each different backup. Similarly to restore backup, you need to browse for the backup image and set a location to save the restored backup. You will need to enter the password used to make that backup. 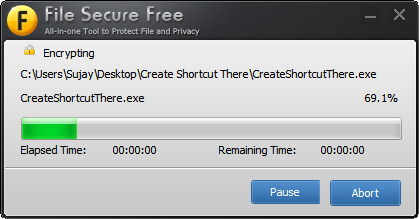 File encryption is easy as well. Add a file or folder and it will ask for a password and you will immediately see that file or files in that folder as encrypted. You can decrypt any files and folders in that list and again encrypt them. It asks for password every time you decrypt files but not at the time of encryption. You can of course use different password for each encryption process. 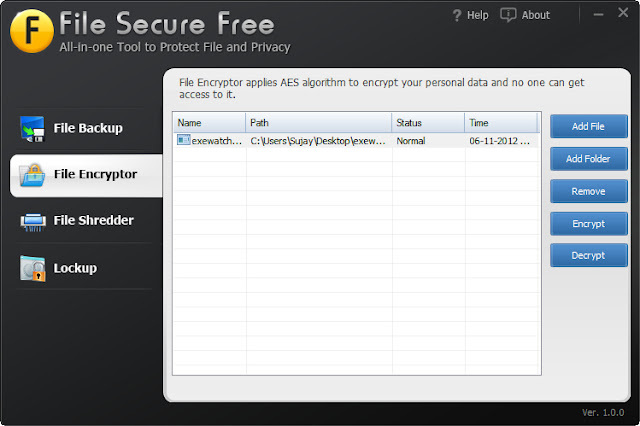 The software uses AES encryption algorithm and adds .dfi extension to the encrypted file. 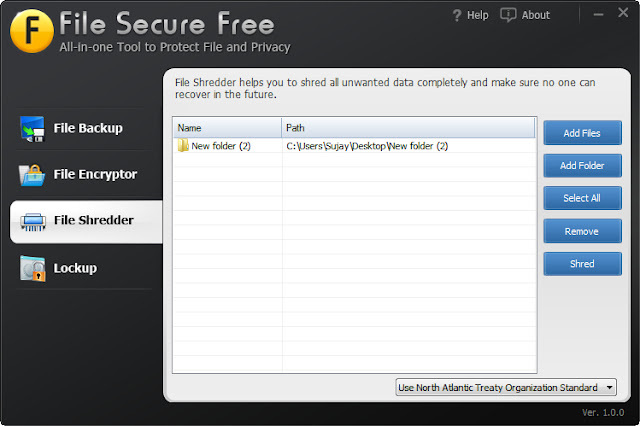 File Shredder of File Secure Free does the same job as Pow Tools File Shredder and File Terminator Free. Simply add files and folders to shred, select them and click on ‘Shred’. By default the shredding is done with Gutmann algorithm but there are additional algorithms like Erase and Write Random Data, National Safety Association Standard, United States Military Standard and North Atlantic Treaty organization Standard. that can be selected from the drop down menu. This module checks in real-time for any inserted USB drive and will let you lock it. You will be able to lock more than one USB connected to the PC. 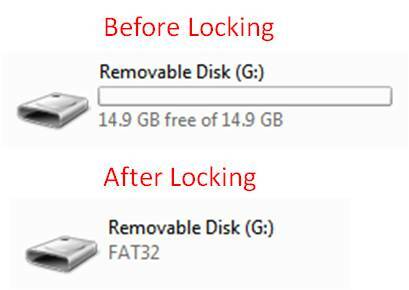 The locked USB will not be accessible by anyone and can be restored back to usable format only with a format (you will loose data) or by unlocking it with File Secure Free (Files will remain intact). I really liked this young tool but it has scopes for improvement. It do not support Drag and Drop. It needs to allow decrypting a particular file in a folder, when a folder have been added for encryption. It need to show the status of the detected USB, locked or unlocked. It needs to have offline documentation. It also should have a update check module. I found a few bugs in it. It should decrypt a file while removing it from the list. It asks for the password to decrypt but do not actually decrypt it. As a result that file become unusable. You need to decrypt a file first and then remove it from the list as a precaution. The progress widow need not to try showing the full file path and should use dots in case it can’t. See the Decryption progress screenshot and you will understand what I meant. The help link lead me to the help documentation of miTracker. 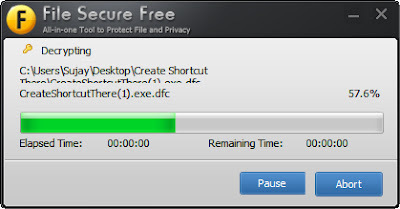 It should lead us to the Quick Guide of File Secure Free. With the precautions mentioned and bugs considered, it’s really worth giving a try. This entry was posted in Backup, Encrypt, File Management, Free, OS Enhancement, Privacy Related, Security Related, Shred, Software, Windows.